Home / QuiBidder of the Week – Josie R.
Congrats to the QuiBidder of the Week for the week of December 10, 2012: Josie R.! Josie has only been bidding on QuiBids for a short while but in that time she’s already scored some truly incredible wins. 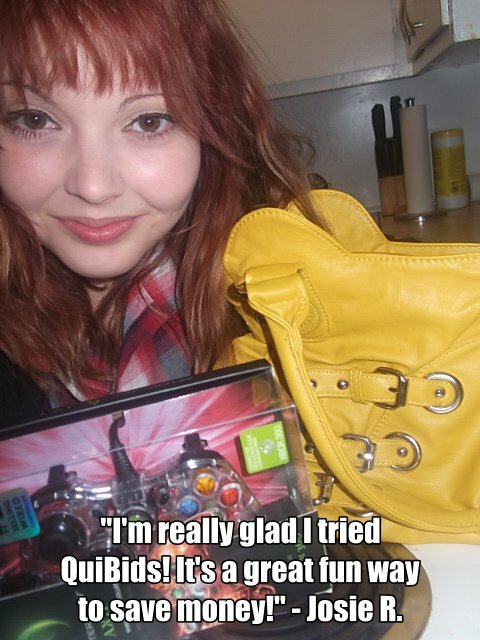 See that Xbox 360 controller she’s holding in the picture below? She won that for one cent! Continue reading to learn more about Josie’s experiences with QuiBids. Tell us your story at the QuiBids Facebook page and you could become the next QuiBidder of the Week and receive a $50 gift card of your choice!